Fast, numerically robust computation of weighted moments via 'Rcpp'. Supports computation on vectors and matrices, and Monoidal append of moments. Moments and cumulants over running fixed length windows can be computed, as well as over time-based windows. Moment computations are via a generalization of Welford's method, as described by Bennett et. (2009) . Fast Robust Moments -- Pick Three! Fast, numerically robust, higher order moments in R, computed via Rcpp, mostly as an exercise to learn Rcpp. Supports computation on vectors and matrices, and Monoidal append (and unappend) of moments. Computations are via the Welford-Terriberry algorithm, as described by Bennett et al. Functions which reduce a vector to an array of moments. Functions which take a vector to a matrix of the running moments. Functions which transform a vector to some normalized form, like a centered, rescaled, z-scored sample, or a summarized form, like the running Sharpe or t-stat. Functions for computing the covariance of a vector robustly. Object representations of moments with join and unjoin methods. A function which computes, say, the kurtosis, typically also computes the mean and standard deviation, and has performed enough computation to easily return the skew. 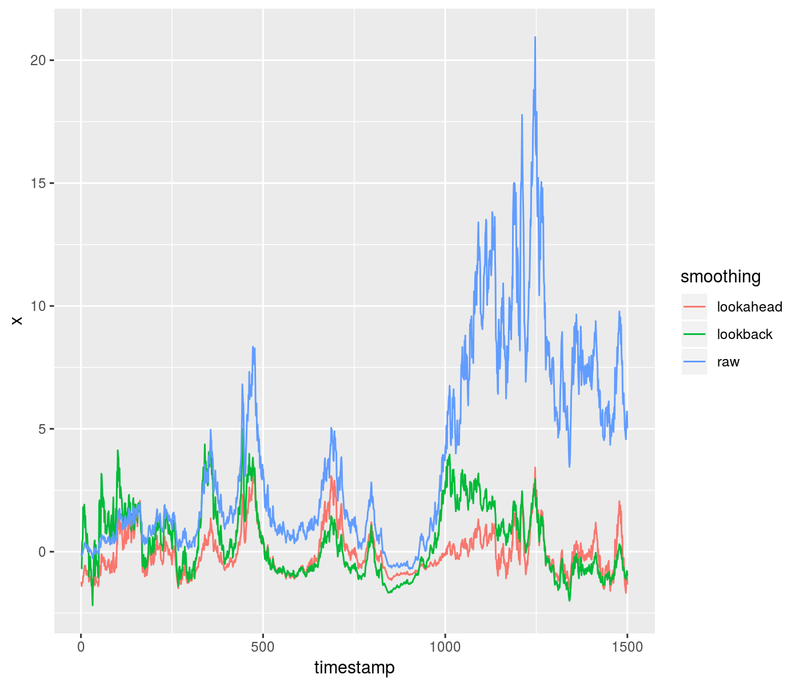 However, the default functions in R for higher order moments discard these lower order moments. So, for example, if you wish to compute Merten's form for the standard error of the Sharpe ratio, you have to call separate functions to compute the kurtosis, skew, standard deviation, and mean. cent_moments: return a k+1-vector of the kth centered moment, the k-1th, all the way down to the 2nd (the variance), then the mean and the observation count. std_moments: return a k+1-vector of the kth standardized moment, the k-1th, all the way down to the 3rd, then the standard deviation, the mean, and the observation count. cent_cumulants: computes the centered cumulants (yes, this is redundant, but they are not standardized). return a k+1-vector of the kth raw cumulant, the k-1th, all the way down to the second, then the mean, and the observation count. std_cumulants: computes the standardized (and, of course, centered) cumulants. return a k+1-vector of the kth standardized cumulant, all the way down to the third, then the variance, the mean, and the observation count. Many of the methods now support the computation of weighted moments. There are a few options around weights: whether to check them for negative values, whether to normalize them to unit mean. # let's compare for speed! The as.centsums object performs the summary (centralized) moment computation, and stores the centralized sums. There is a print method that shows raw, centralized, and standardized moments of the ingested data. This object supports concatenation and unconcatenation. These should satisfy 'monoidal homomorphism', meaning that concatenation and taking moments commute with each other. So if you have two vectors, x1 and x2, the following should be equal: c(as.centsums(x1,4),as.centsums(x2,4)) and as.centsums(c(x1,x2),4). Moreover, the following should also be equal: as.centsums(c(x1,x2),4) %-% as.centsums(x2,4)) and as.centsums(x1,4). This is a small step of the way towards fast machine learning methods (along the lines of Mike Izbicki's Hlearn library). ## An object of class "centcosums"
Since an online algorithm is used, we can compute cumulative running moments. Moreover, we can remove observations, and thus compute moments over a fixed length lookback window. The code checks for negative even moments caused by roundoff, and restarts the computation to correct; periodic recomputation can be forced by an input parameter. RollingWindow, available only from github. Of these three, it seems that RollingWindow implements the optimal algorithm of reusing computations, while the other two packages gain efficiency from parallelization and implementation in C++. running_centered : from the current value, subtract the mean over the trailing window. running_scaled: divide the current value by the standard deviation over the trailing window. running_zscored: from the current value, subtract the mean then divide by the standard deviation over the trailing window. running_sharpe: divide the mean by the standard deviation over the trailing window. There is a boolean flag to also compute and return the Mertens' form of the standard error of the Sharpe ratio over the trailing window in the second column. running_tstat: compute the t-stat over the trailing window. running_cumulants: computes cumulants over the trailing window. running_apx_quantiles: computes approximate quantiles over the trailing window based on the cumulants and the Cornish-Fisher approximation. running_apx_median: uses running_apx_quantiles to give the approximate median over the trailing window. The functions running_centered, running_scaled and running_zscored take an optional lookahead parameter that allows you to peek ahead (or behind if negative) to the computed moments for comparing against the current value. These are not supported for running_sharpe or running_tstat because they do not have an idea of the 'current value'. Compute the total sales over the past six months, as of every day. 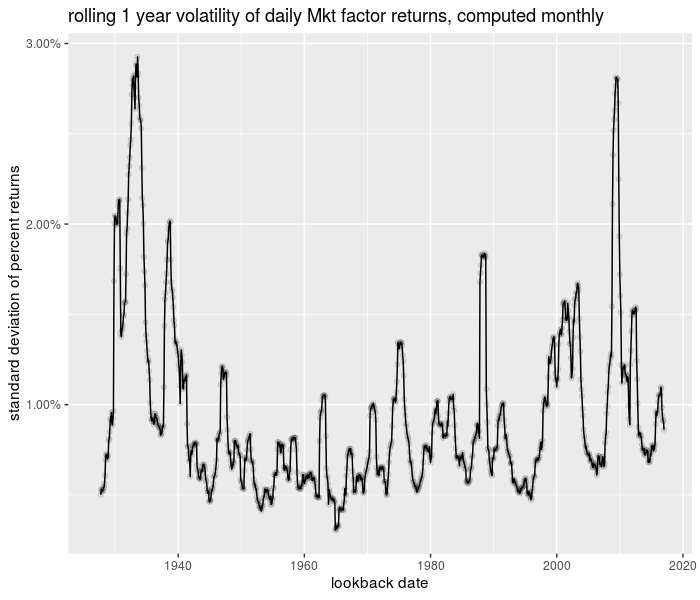 Compute the volatility of an asset's daily returns, over a yearly window, computed at the end of every trading month. These are now supported in fromo via the t_running class of functions, which are like the running functions, but accept also the 'times' at which the input are marked, and optionally also the times at which one will 'look back' to perform the computations. The times can be computed implicitly as the cumulative sum of given (non-negative) time deltas. More seriously, here we compare the running_sd3 function, which computes the standard deviation, mean and number of elements with the roll_sd and roll_mean functions from the roll package.